We zetten klassieker ‘1992 Lancia Delta HF Integrale Evo 1’ tegenover de moderne ‘ 2016 Ford Focus RS’, maar gaat de winst hiermee vanzelfsprekend naar het nieuwe? Van de vele tests werd de 2016 Focus RS vergeleken met even zo nieuwe andere Hot Hatches. Dit keer wordt hij tegenover de Lancia Delta HF Integrale Evo 1 gezet, een legende die zich ook in de Rallysport heeft bewezen. Eens zien wat 24 jaar ontwikkeling van Hot Hatches precies het verschil maakt, je leest het hieronder. 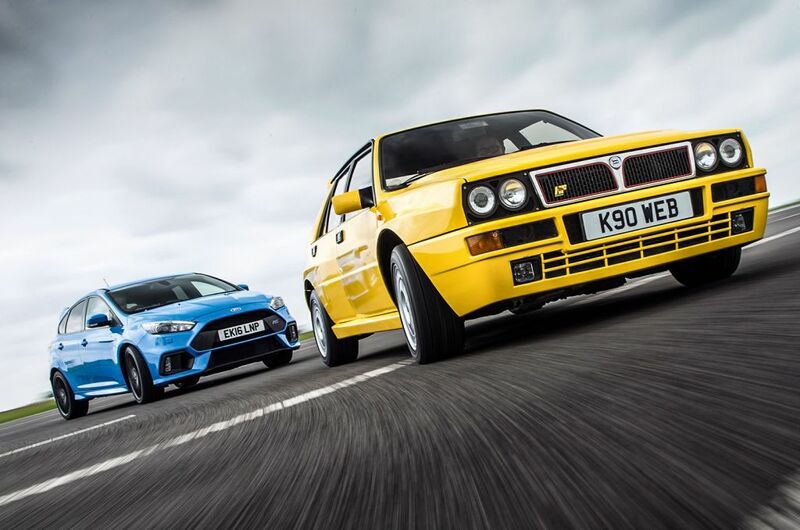 We pit the 1992 classic Lancia Delta HF Integrale against the modern Ford Focus RS, but does new always rule over used? 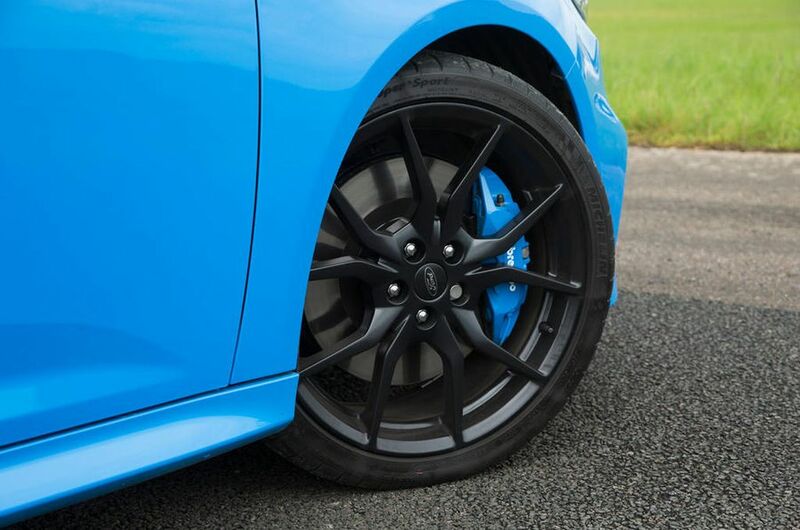 The Ford Focus RS is a stupendous bargain at £31,000 – a high-performance limpet that has attracted comparisons with the Nissan GT-R, itself a recognised steal at three times the price. Like the GT-R, the RS depends heavily on electronic trickery to make good its combination of four-wheel drive and turbo power. But although digital devilry can seemingly untangle your local B-road at a stroke, it doesn’t always deliver when it comes to outright driver engagement. And for the same money as the Focus, you can buy its analogue alternative, a storied machine whose development led to six World Rally Championship constructors’ titles and was voted greatest-ever hot hatch by Autocar readers: the Lancia Delta HF Integrale. 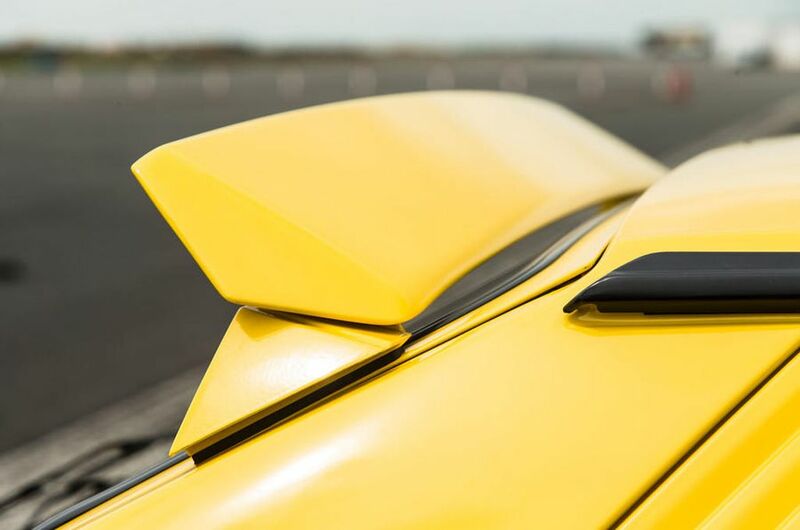 The Focus has two clutch packs that monitor a barrage of sensors 100 times each second to distribute up to 70% of its torque to the back axle in normal conditions, and 100% of that can be flipped between the rear wheels in 0.06sec. 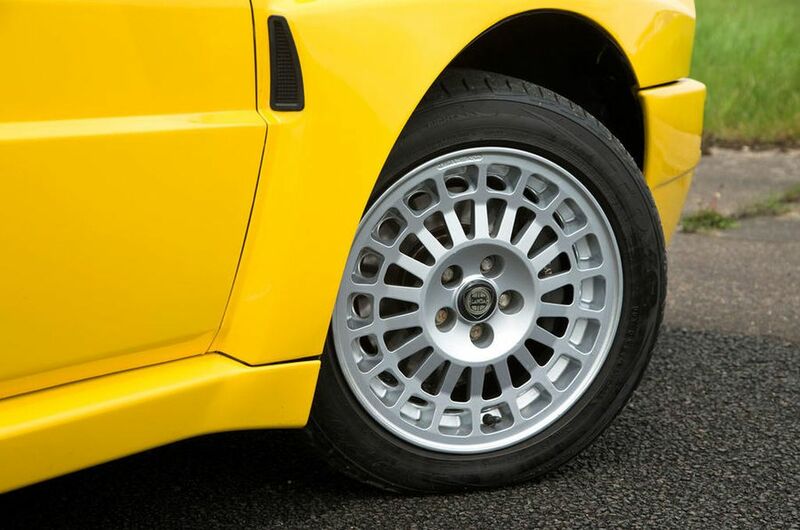 In contrast, the Integrale relies on mechanical conduits with a centre viscous coupling (variable, 53% rear biased by default) and Torsen differential that sends up to 83% of drive to either side of the rear axle. And it’s electromechanical steering, adaptive dampers and ESC for the Focus versus hydraulic steering and passive dampers in the Delta, where the stability control lies in the palms of your hands and soles of your feet alone. The turbocharged all-paw super-hatch could not be skinned in two more distinct ways. The final Integrales, the Evo 1 (1991-1993) and Evo 2 (1993-1994), are the ultimate iterations of the breed, with extra horsepower, bigger brakes, chassis stiffening and sturdier, reconfigured suspension with extra travel compared with the HF Integrale 16v that came before. There’s also an adjustable rear wing and swollen bodywork required to house wider tracks (its box arches were purportedly based on a Fiat Ducato’s and took a single working weekend to design – different times indeed). Prices have been rising steadily of late and decent ones cost from £25,000, with rare versions topping £100,000. The yellow car here has been in my care for 15 years and is a Giallo Ferrari edition Evo 1, which came with chunky black leather Recaros, air-con and ABS as standard. Following recent restoration, it’s worth around the same as the Focus. 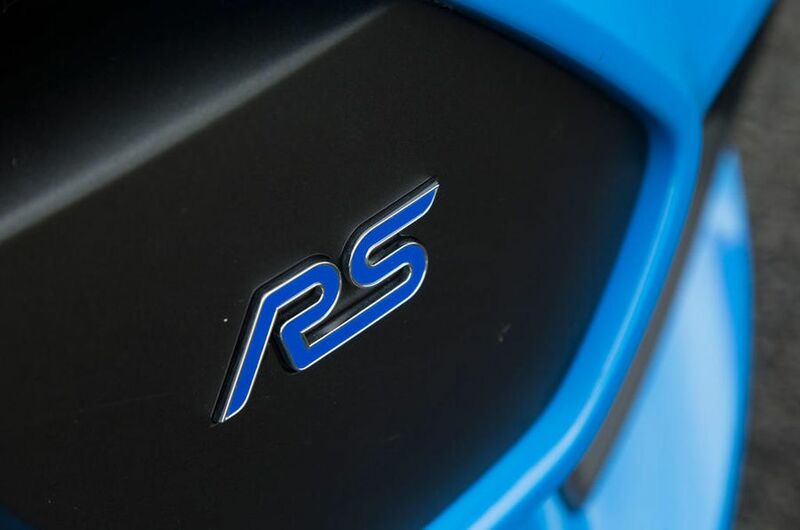 This will possibly be the only Focus RS twin test where it takes interior honours. 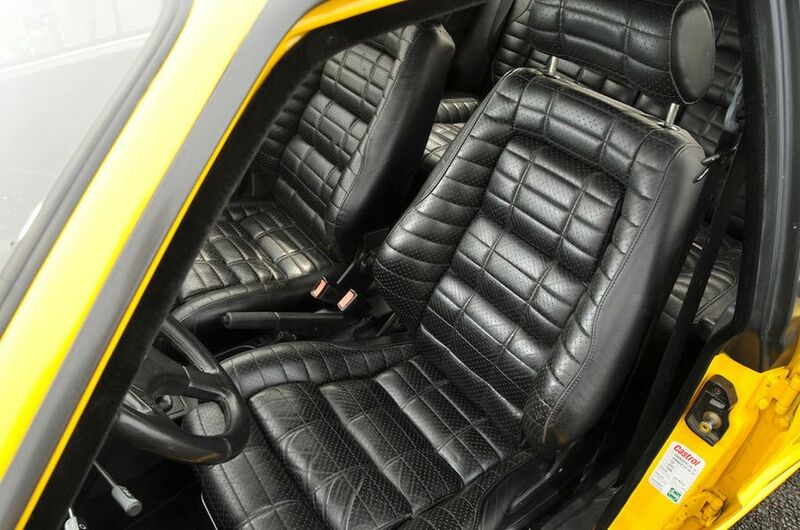 Yes, it’s a predictably glamourless space, with variable material quality and high-set seats, but next to the Integrale’s brittle plastics, vinyl, squared-off buttons, unretentive chairs, spindly, idiosyncratic stalks and low, shallow, rake-only steering wheel that hides half the speedo, it’s an earthbound Dreamliner. 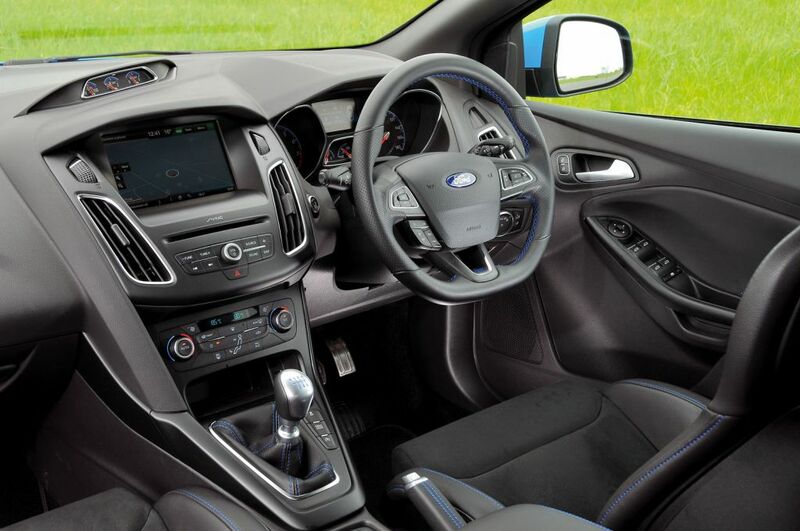 The Ford gets dual-zone climate control, DAB radio, Bluetooth, adaptive headlights and automatic wipers. A bigger question: does the Integrale still feel fast? Its Garrett T3-blown 2.0-litre engine is a full 135bhp shy of the Focus’s 345bhp 2.3, and although the Italian car weighs 249kg less, it still comes up short on power to weight at 156bhp per tonne to the Ford’s 216bhp. But our road test archive records it as only 0.7sec slower to 60mph, at 6.0sec, despite the Focus’s launch control. 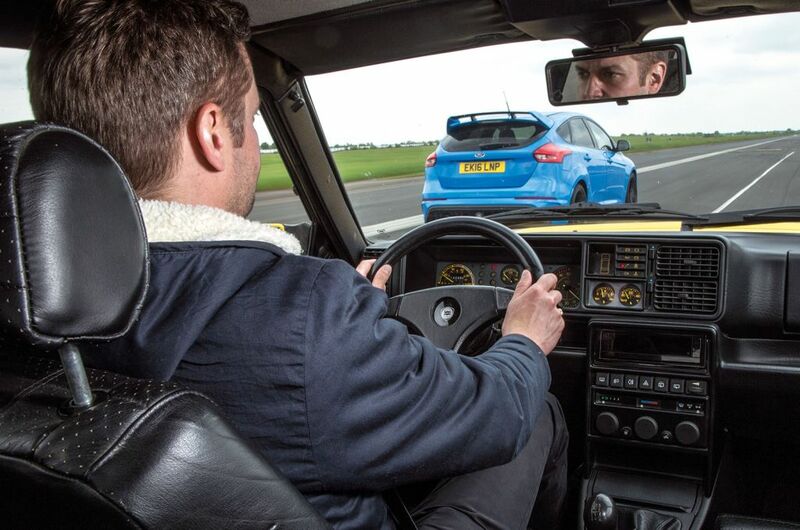 A rollingstart drag during our shoot was comfortably won by the Focus, but the Integrale was far from disgraced. So, yes, it still feels fast. Even more so because of the Lancia’s comically binary power delivery: floor the throttle at low revs and you can count the lag out loud. But do so beyond 3750rpm and the turbo kicks in more quickly with a heady, bracing spurt. High revs and a spooling turbo are to this engine what tinned greens are to Popeye. The low-inertia, twin-scroll turbocharged engine in the Focus – with its extra Coke can of capacity – is far more responsive across the board. There’s some low-rev lag, but that soon dissipates, the engine packing a swift and mighty punch from the mid-range upwards. 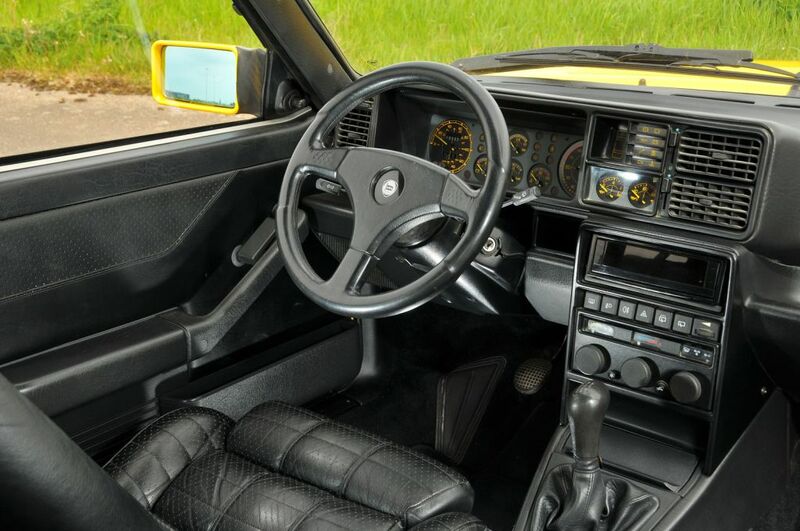 The sturdy, short-throw gearshift is obedient even when slammed, contrasting with the Integrale’s more languid action via a long gearstick that’s topped with a clod of rubber. Still, it is accurate and feels sweet when not manhandled. The Lancia’s engine note is more authentic-sounding than the Ford’s, with a robust growl that might be more enjoyable were it not for the wall of sound emanating from other parts of the car. Driveline fizz, scuttle shake, squeaking leather, wind noise and a chassis that resonates when any wheel meets a sharp edge are loud enough, but then there’s the exhaust, whose downsized aftermarket silencer is bassy in traffic and vents a howling gale when the turbo’s toiling. All that racket is what dates the Lancia more than anything else. You can enjoy the Ford’s warble, roar and contrived pop and bang more readily but, in truth, neither engine is an aural charmer. 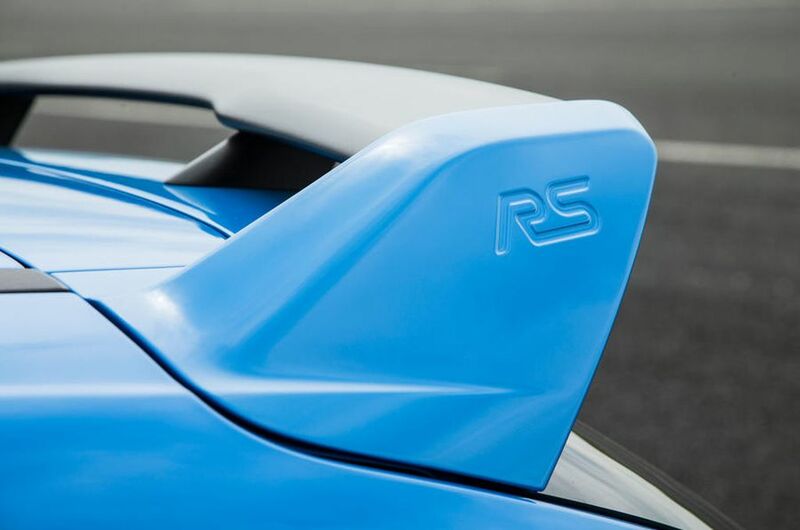 On track, the Focus RS flexes its technical muscle to scythe rings around the Integrale. Its combination of incisiveness, poise and traction mainlines that 345bhp to the ground with remarkable ease and efficiency, especially with the dampers in ultrafirm Sport mode. Turn in late and hard and rather than submitting to understeer, it just digs in and swallows the apex whole. In Drift and Track modes, you can have a benign kick of the tail upon exit, too. The Integrale feels sloppy in comparison, its main on-track flaws being an over-abundance of suspension travel and 25% plumper tyres yielding copious body roll and a greater appetite for understeer. It can’t hold a candle to the Focus here. But on subsiding British B-roads, the old-timer comes into its own for the same reasons. Where – even with the dampers in Normal – the Ford bobbles along, rebounding assuredly but aggressively from every hump and lump, the Lancia laps up the terrain like an Ariel Nomad. On a bumpy straight under full throttle, the Focus’s torque-dispatching electronics seem to go into confused overdrive, heaving the chassis this way and that, while the imperturbable physics of the Integrale’s mechanical driveline solidly grinds away, the tyres kept flush with the blacktop by those plush dampers while the feelsome, ever-so-natural steering faithfully maintains its heading. There’s still that big moment of roll into a corner, but once the Lancia has settled in, there’s a sweet spot where the suspension, steering and traction unite to pivot the car around, somehow retaining grip when you add steering angle and/or throttle. This lets you keep the turbo spooling, ready to deliver that punch of torque when the road straightens. Although the Integrale’s body shimmies, its chassis shows a wonderful fluidity that’s almost stately compared with the faster, more frantic Ford, whose less consistently weighted steering offers plenty of accuracy but little of the nuance. That’s the limited space where the fascination lies with the Lancia: it can still turn any lumpy back road into a WRC special stage. But it’s a space made even smaller by being left-hand drive only, and by becoming so rare that you’d be foolish to expose its rust-hungry steel to road use outside the warmer half of the year. 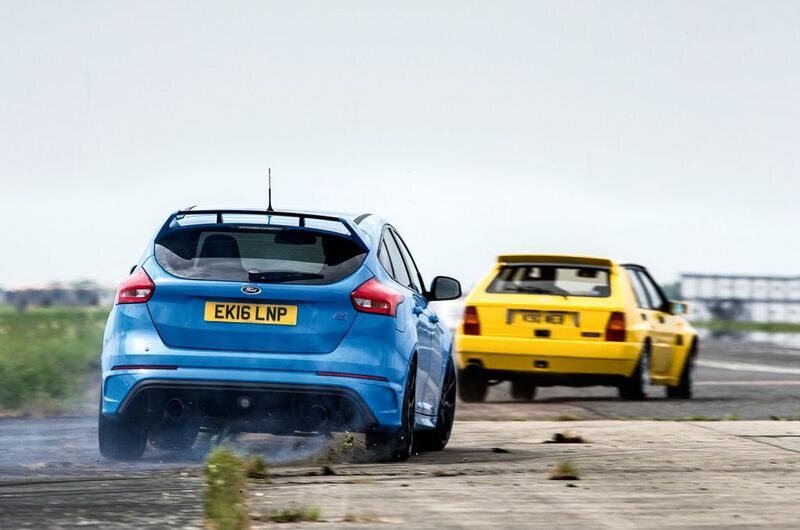 As a usable thriller, the Focus RS strolls to victory. Its combination of pace and ludicrous handling limits shows the older car a clean pair of heels, and it is backed up by respectable motorway manners, build quality, practicality and running costs. It’s the affordable performance hatch for our times, capable of providing a brain-tingling legal high that you could – and probably would – shoot every day.